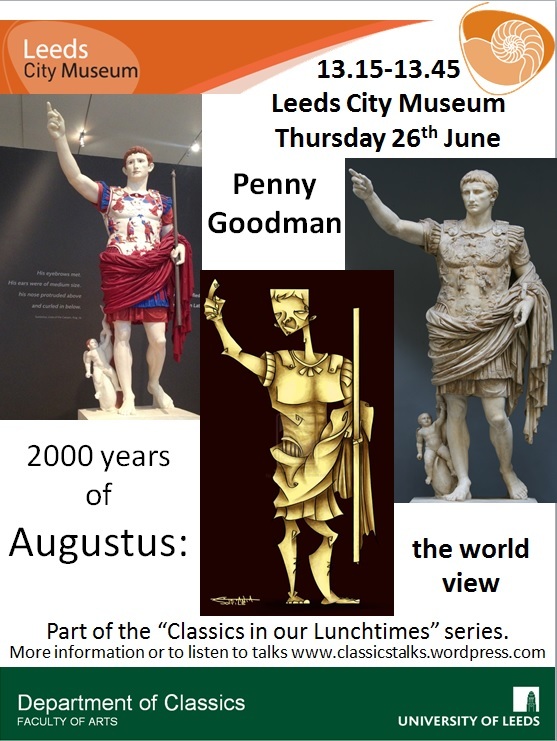 This month’s Classics in our Lunchtimes talk was delivered by Dr Penny Goodman, leader of the Commemorating Augustus project, which explores the “afterlife” of Augustus and perceptions of him during the 2,000 years since his death on 19th August AD14. Having previously presented a snapshot of Leeds’ views on Augustus for this series to great interest, this time she presented a broader survey of activities around the world during 2014 that commemorate Augustus. Opening with a consideration of Roman and modern concepts of anniversaries and commemorations, this excellent talk focused in on two commemorative events, a festival in Tarragona in Spain and the renovation of the Mausoloeum of Augustus and the surrounding area in Rome (last renovated by Mussolini for his commemoration of 2,000 years since Augustus’ birth in 1938). The content and motivation for two events strongly suggest that Augustus is not just part of European/Western cultural/historical identity but that he has particular local significance and that such relationships are forged anew in “marker” years. Penny is also organising a major international conference with speakers (including classicists, art historians and arichtects) who will explore Augustus and Augustus’ legacy in a variety of contexts, genres and historical periods, including the Renaissance, Second World War and modern TV, among others. The conference is to be held at Devonshire Hall, Leeds, on 18th-20th August 2014 and is open to all (subject to payment of the conference fee). The conference papers will be recorded and made available as streamed audio files together with handouts and slideshows for virtual delegates (fee £40). For further details of the conference, including fees and the full programme, please see the Conference Website.